Every design begins with a mood that the designer wishes to create. The mood may be one that inspires creativity, one that brings peace and relaxation, or one that brings pleasant memories to mind. Many creators find a common theme surfacing in every design they create. When you consider the design for your home, what mood are you hoping to create for your guests? What about for your bathroom specifically? While the bathroom is probably the smallest room in your house, it is also the room that most guests will see when they visit. You have invested hours of effort in designing the arrangements, colors, and textures that make the rest of your house a home. With limited space, a bathroom can be a difficult place to bring your design vision to life. So while your bathroom must remain functional, there is certainly no need to sacrifice style and comfort. This is why we bring you the fresh, modern bathroom decor ideas that you have been searching for. These bathroom decor ideas incorporate a variety of themes with unique ways to weave utility and design together to create a beautiful space. Whether you are just getting started with your design or are just looking for the finishing touches, you fill find inspirational decor ideas to create the bathroom of your dreams. 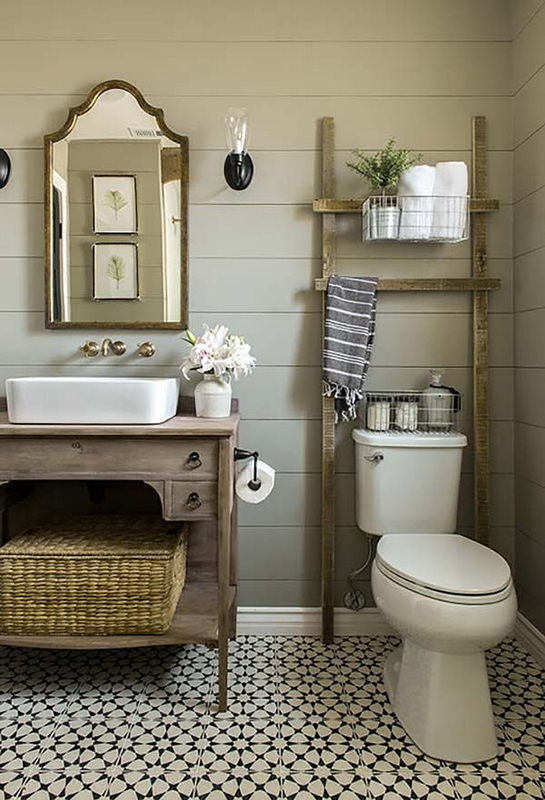 Shelving above the toilet is a great way to effectively use the space in a small bathroom, but the typical store-bought shelves are a bit flimsy and cheap-looking. 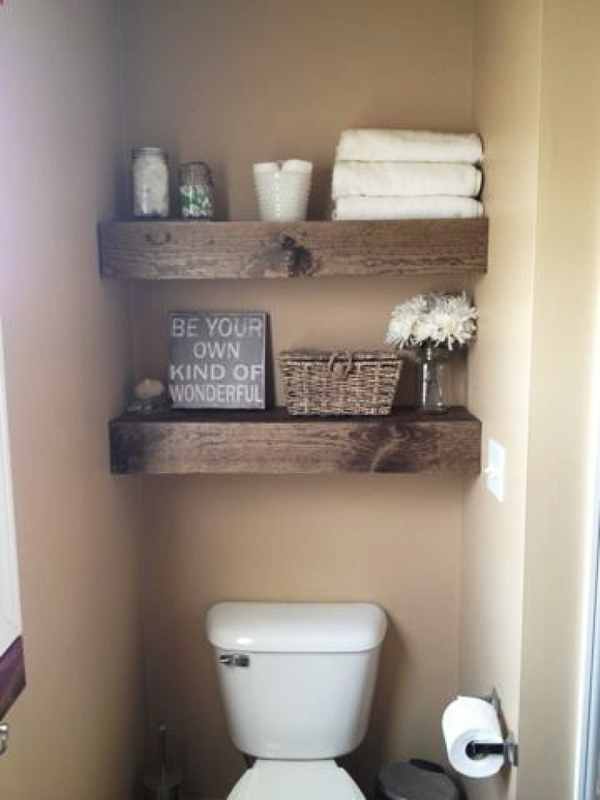 This interesting twist on the premise is perfect for those who love rustic bathroom decor ideas. 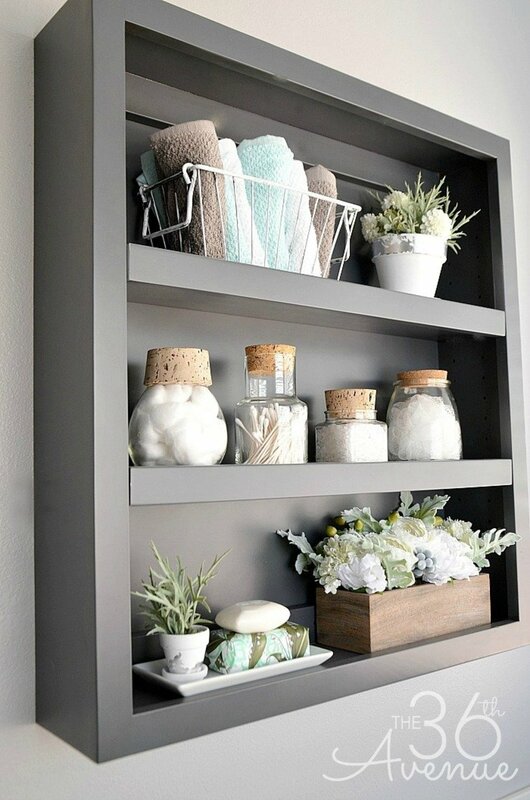 The “shelf” is really more of a frame on which you can hang a towel or a metal basket to hold things. In this case, the wood is weathered and matches the wood in the table used as a vanity. Re-purposing a small desk is a nice touch for making the sink look different, which the basket underneath still provides hidden storage. In a small space like this one, you don’t have much room to work with, so choosing floating shelves that completely fill the narrow space is the right choice. Since the shelves don’t have legs that need to sit on the floor, you don’t have to worry about finding space for the cleaning brush and a small trash can. 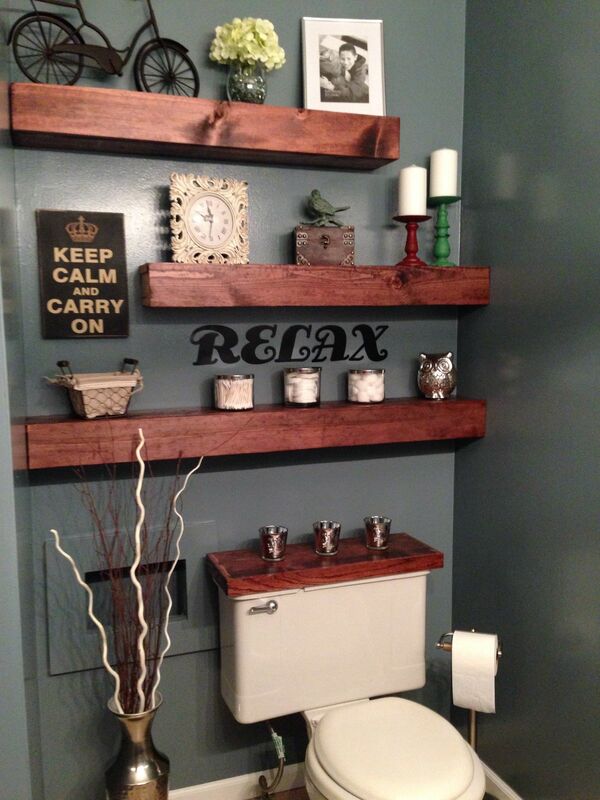 Once you have these shelves, you can fill them with any type of bathroom decor you want. 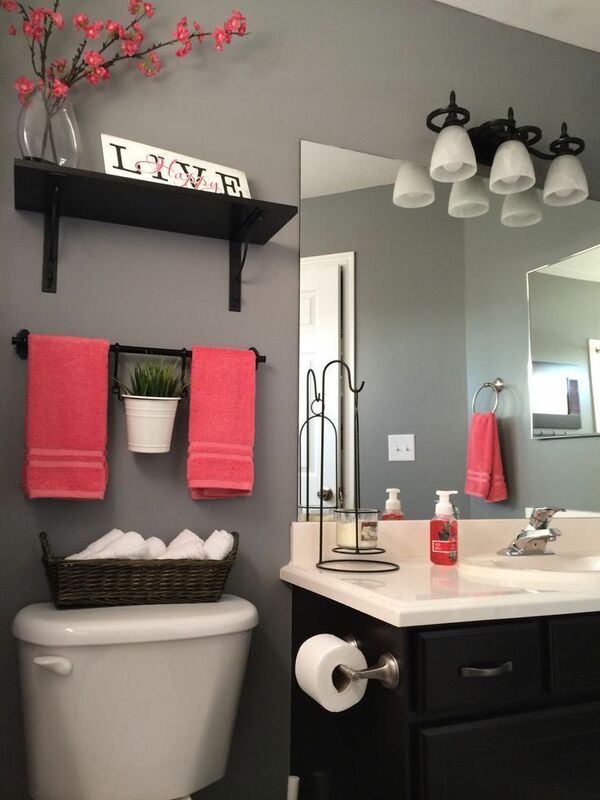 This homeowner has chosen a friendly message along with some practical items like extra towels and flowers to brighten up the look. If you have lovely tiled walls and floors in the bathroom, you want bathroom decor ideas that will make them stand out. In this case, the tiles are white, so the dark wood around the mirror and the black faucet and drawer pulls offers a nice contrast. With a large enough sink like you see here, the flowering plant offers an opportunity to add color to the space. A holder for the hand soap and lotion and a cover for the tissue box helps keep things neat and ties these basic items in with the look. Some of the best bathroom ideas are the ones that are the most practical. This simple DIY idea allows you to easily contain some of the clutter you typically find in the bathroom while still having the things you regularly need close at hand. Simply attach small mason jars to a board and hang it up by the sink. 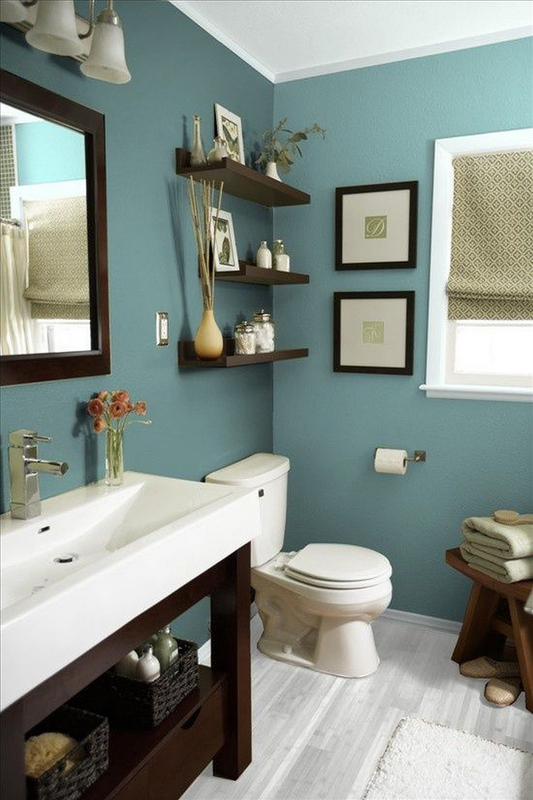 You can paint the board in different colors to match the style of your bathroom. An added benefit of this is that it gets the clutter off of the sink, giving you more space in the area for other things. This small space also makes use of floating shelves, but since the space is a bit larger than the one in the other photo, the homeowner has chosen to use some shelves that don’t cover the enter width of the nook. This allows you to have extra space to hang photos and to place bathroom decor that’s a bit taller, like the candles you see here. Adding a matching shelf on the back of the toilet tank is an extra-nice touch that pulls the entire look together. This is great when you need bathroom decor ideas that can incorporate many of your little knick-knacks. 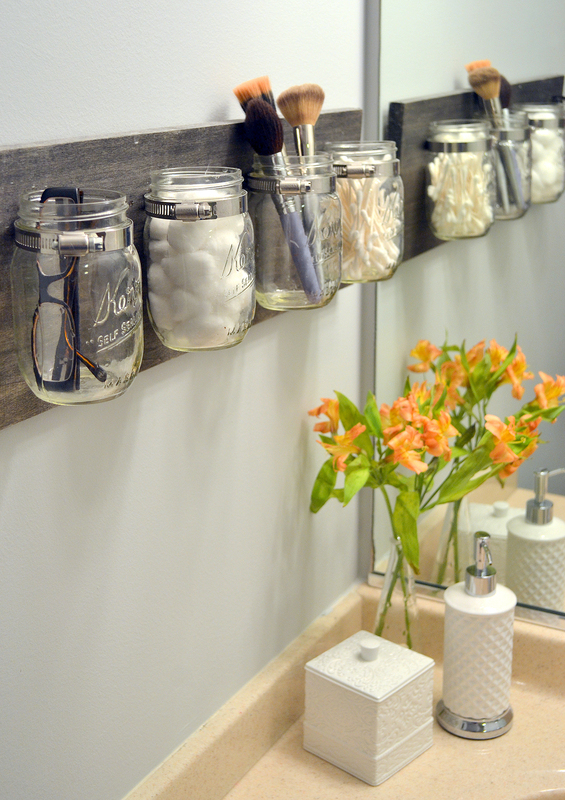 Mason jars are an inexpensive solution for storage, and this picture shows how you can take a simple idea and change it up to fit a variety of bathroom designs. By painting the jars, you can have them fit in well with any color palette. It’s also easy to see how different jar sizes can work better for holding different types of objects. A shorter jar, for instance, works better for holding cotton swabs, while taller jars work well for holding makeup brushes. 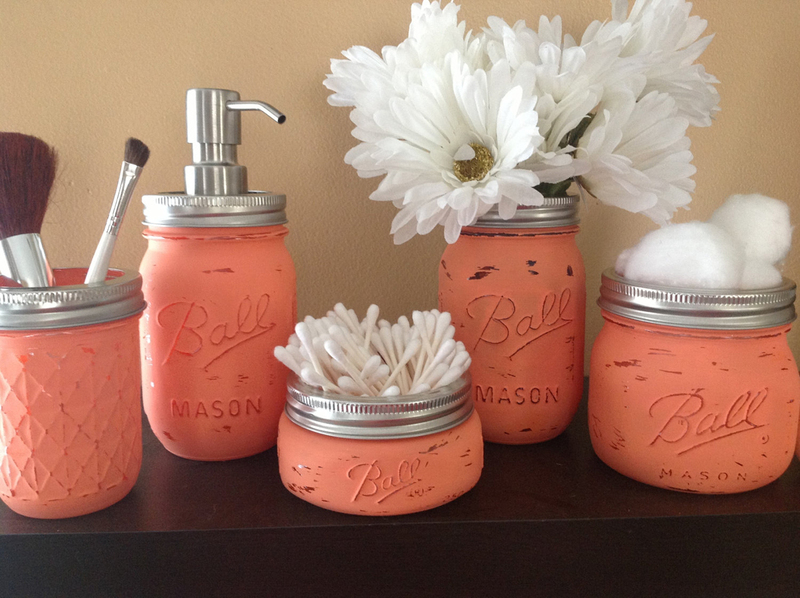 Simply arrange these jars on the bathroom sink or on a shelf in the bathroom. Most people find the beach relaxing, so it’s common to see elements of this incorporated into different bathroom ideas. 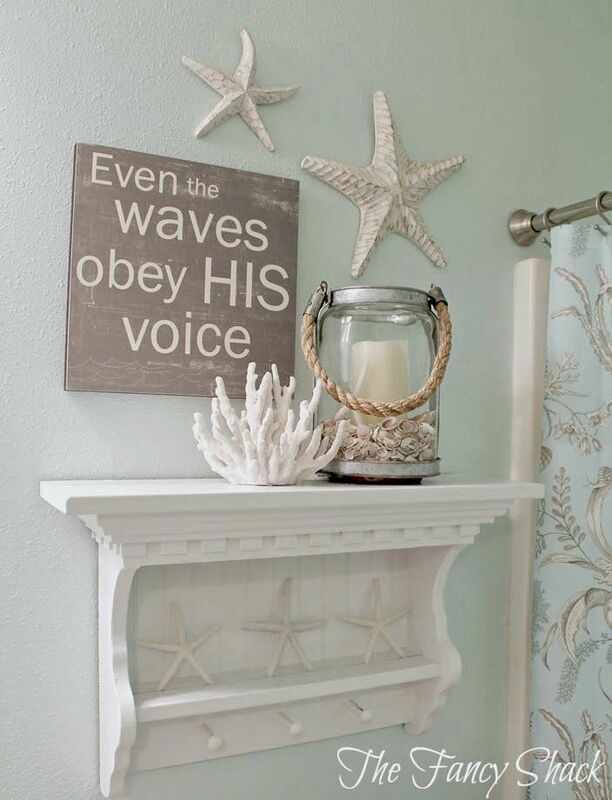 Here, light blue paint on the walls creates a relaxing environment, while the sea stars and shells set the beach tone. This pegs on this shelf are particularly nice because they can easily hold towels when you’re in the shower. It’s a small detail, but the shower curtain rod here is obviously a big step above the one you probably had in your first apartment. It costs a bit more, but it makes a big statement. Bathroom designs that contrast dark wood with the white porcelain of the toilet and sink area always have a classy look, but they can get a bit boring. When you add a pop of color, like you see here, it can really brighten up the place. This designer has taken the color from the cherry blossoms and incorporated it into the towels and even the soap. You could easily use the colors of another type of flower as inspiration. Think about sunflowers or lilacs. Another interesting element from this bathroom, is the small bucket of grass hanging in between the hand towels. An unexpected detail like this is just the type of thing that can set you apart from others. You don’t always need a lot of space to get more organized. This simple shelf might be about the size of a medicine cabinet, but everything is out in the open, giving you more opportunities to use it for decorating. Bathroom decor ideas like this one are both practical (giving you space to store towels and cotton swabs) and beautiful (with additional space for a few plants). Best of all, you can paint this whatever color you like to fit with your personal style. 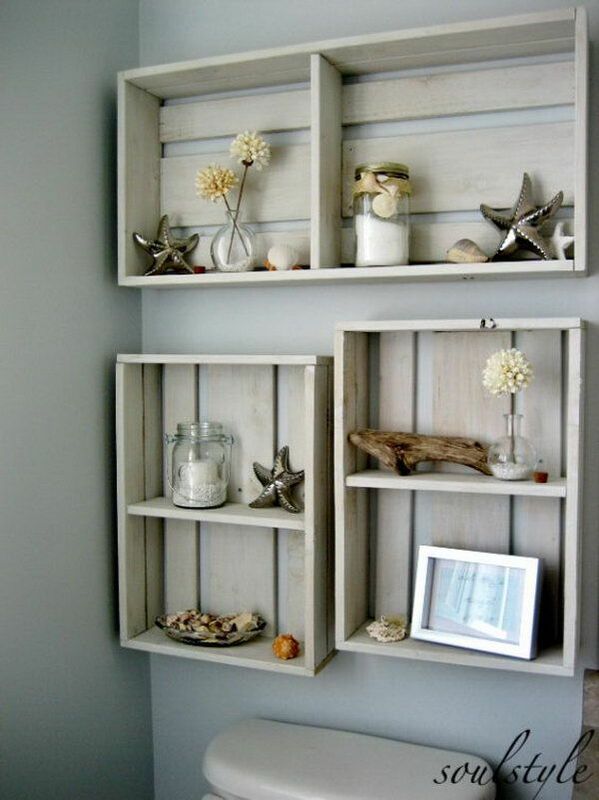 Remember that a shelf like this will be heavier than floating shelves, so be sure you’re anchoring it into the wall’s studs to be sure that it’s secure. 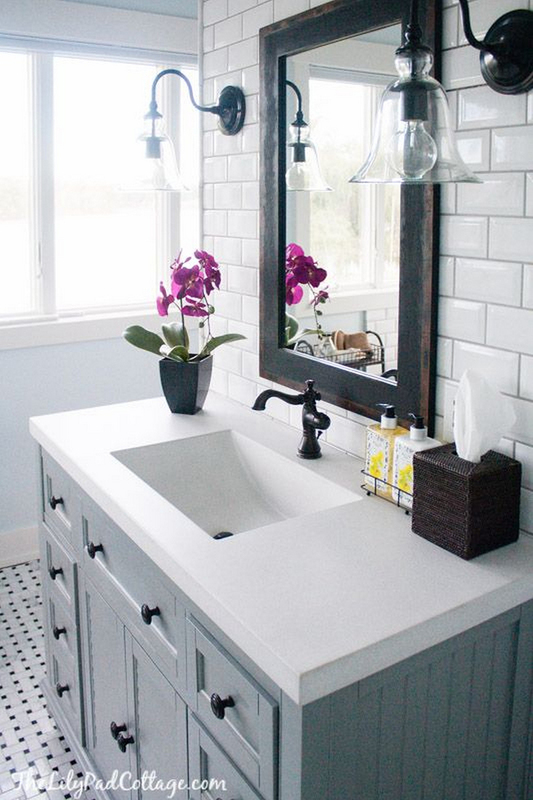 Easy DIY bathroom ideas like this one can make a big statement. 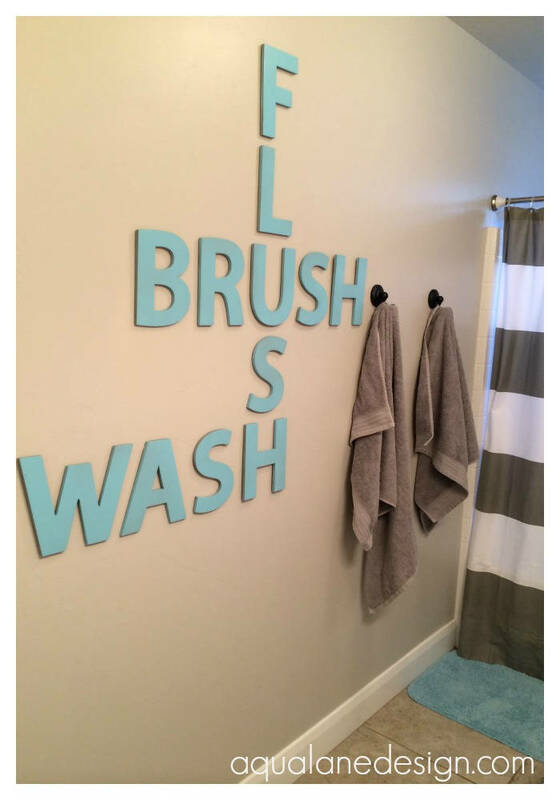 The letters here form a crossword puzzle-style reminder to anyone who comes into the bathroom. You might imagine that this could work well if you have kids who might forget to do these things, but you could also take the concept and change the words to something more suited to your family. Letters like this are typically available in craft stores, and you can paint them to match your shower curtain or bath rug. The striped shower curtain is another nice touch, adding some interest while still being neutral. Simple boxes from the craft store can be instantly transformed into shelves that will work with all types of bathroom ideas. You can see here how the same box can be turned into a vertical shelf with two shelves or a horizontal one with a divider. Both work equally well whether you’re using the shelves to store items like hand towels or extra rolls of toilet paper or as a place to put your decorations. Here, they’ve chosen a beach design, with shells and drift wood. In a kids’ bathroom, you might choose something more fun and colorful. Floating shelves again rule the scene here, but these ones are placed near the sink rather than above the toilet. This makes them even better for holding extra washcloths and hand towels, especially if you have frequent guests. You might be more likely to see tile backsplashes in a list of kitchen ideas rather than bathroom ideas, but you can easily see how such a small change can make a big difference in the look of the space. Look carefully at your options and remember that you’ll need a backsplash that will be able to hold up to the humidity of the bathroom. A darker blue on the walls in this bathroom still has the calming effect that you’re looking for in bathroom decor ideas, while being a bolder choice. The floor in this picture also stands out. Few people choose wood for the floor in a bathroom because it’s not water-resistant, but here you have the look of a light-colored wood. It’s only a look, though. These days, you can find vinyl and laminate tiles that look like wood while being safe for the bathroom. If you’re replacing a floor, be sure to ask about all of your options. If you have the space for it, an arrangement like this can be a nice bit of bathroom decor for your room, and it’s easy to make yourself. Simply take an elegant serving dish like this one, fill it half-way with sand and place a few shells inside. The large candle in the middle provides you with mood lighting, and LED versions of candles like this offer a safer alternative. 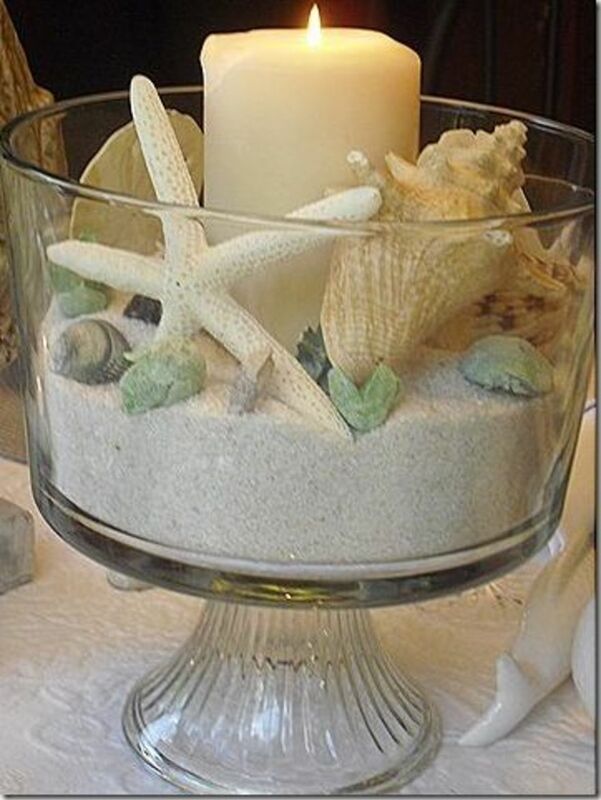 Use sand from the craft store rather than sand from the beach to avoid causing a stink.